In memory of the Space Shuttle Columbia crewmembers who lost their lives on February 1, 2003, a massive collection of flowers, balloons, flags, signs, and other arrangements were placed at the Johnson Space Center (JSC) sign at the main entrance to the center. "This is indeed a tragic day for the NASA family, for the families of the astronauts who flew on STS-107, and likewise is tragic for the Nation. "Immediately upon indication of a loss of communications from STS-107, at a little after 9:00 a.m. this morning, we began our contingency plan to preserve all the information relative to the flight activities. "I immediately advised the President and the Secretary of Homeland Security, Tom Ridge, at the point after landing was due to have occurred at 9:16 a.m., and spoke to them very briefly to advise them that we had lost contact with the Shuttle orbiter, Columbia, and STS-107 crew. They offered, the President specifically offered, full and immediate support to determine the appropriate steps to be taken. "We then spent the next hour and a half working through the details and information of what we have received and Bill Readdy, Associate Administrator for the NASA Office of Space Flight, will walk you through the specifics of those operational and technical issues. "We met with the family members of the astronauts who were here at the Kennedy Space Center and are soon to be departing back to the Johnson Space Center in Houston. The President has called and spoken to the family members to express our deepest national regrets. We have assured them that we will begin the process immediately to recover their loved ones and understand the cause of this tragedy. "We have no indication that the mishap was caused by anything or anyone on the ground. "We assembled a Mishap Investigation Team at a point past the stage that the orbiter was to have landed here at Kennedy Space Center a little after 9:30. That team, in turn, is coordinating on a regular basis on all the facts that are pertaining to this from the Johnson Space Center with help from a Rapid Response Team from here at the Kennedy Space Center, as well participants from the Marshall Space Flight Center in Huntsville, Alabama. "In addition to these internal efforts, we have appointed a Mishap Investigation Board, an external group of people who are independent from NASA who will be charged with the responsibility to look at all the information that was immediately locked down right after the absence of communications. "Each of these individuals are Safety and Mission Assurance related officials in other departments of the Federal government, from the Air Force, the Navy, the Department of Transportation, and across the federal expanse. This Investigation Team will be chaired by an individual who is external to the federal agencies and will have the responsibility to coordinate all the information from an external view. "So we'll be conducting both the internal activity as well as the external review immediately to ascertain the causes and circumstances under which this tragedy occurred. "We have pulled together all the federal agencies and local governments as well. I have been in discussion several times this morning with Secretary Tom Ridge. The effort is under way to coordinate an understanding of exactly where the orbiter path had taken it from West Texas towards the Kennedy Space Center here in Florida and to make sure that the material on the ground is secured so that the investigation can begin promptly. "We would urge people who believe they have found any material to stay away from it and to please contact local officials. The local first responder groups for emergency services have been authorized and directed by Secretary Tom Ridge to assist in any way. The Federal Emergency Management Agency is coordinating that effort on behalf of the Department of Homeland Security. 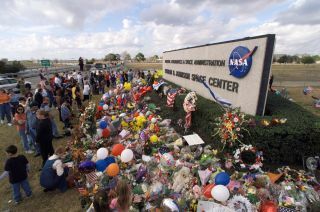 "I was here this morning with the families of the astronauts and their friends. It started out as a pretty happy morning, as we awaited the landing of STS-107. We had highly anticipated their return because we couldn't wait to congratulate them for their extraordinary performance and their excellent effort on this very important science mission. "They dedicated their lives to pushing scientific challenges for all of us here on Earth. They dedicated themselves to that objective and did it with a happy heart, willingly and with great enthusiasm. "The loss of this valued crew is something we will never be able to get over. We have assured the families that we will do everything, everything we can possibly do to guarantee that we work our way through this horrific tragedy. We ask the members of the media to honor that too. Please respect their privacy and please understand the tragedy that they are going through at this time. We will help the media assure that this will be the case as well. "We trust the prayers of the Nation will be with them and with their families. A more courageous group of people you could not have hoped to know- an extraordinary group of astronauts who gave their lives-and the families of these crewmembers. They knew exactly the risks. And never, ever did we want to see a circumstance in which this could happen. "We diligently dedicate ourselves every single day to assuring these things don't occur. And when they do we have to act responsibly, accountably and that is exactly what we will do."